How to use up down bar for Excel chart in C#, VB.NET? This article explains how to use Up/Down Bars in chart using XlsIO. 1. 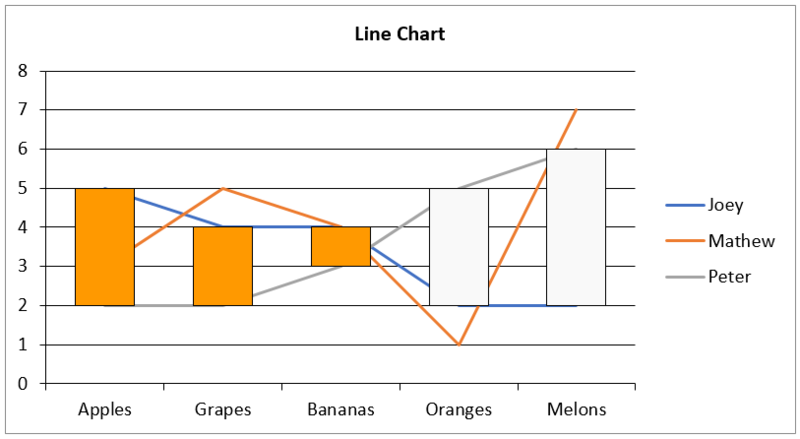 Up bars connect points on the first series in the chart group with higher values on the last series in the chart group (the lines go up from the first series). 2. Down bars connect points on the first series in the chart group with lower values on the last series in the chart group (the lines go down from the first series). 3. In XlsIO we can format the up or down bar by using FirstDropBar and SecondDropBar properties in SeriesFormat respectively. Note: Only line charts and stock charts do support Up/Down bars. Trying to use drop bar properties to other charts might throw exception or the changes will not be reflected in the output document because those charts does not support Up/Down bars. The following C#/ VB.NET complete code snippet shows how to use up/down bars in chart using XlsIO.